Bendigo and Adelaide Bank’s new managing director Marnie Baker hopes to capitalise on a loss of trust in banks to lure customers away from the big four with a new, digital bank Up, and the automated home loan application platform Tic:Toc. Although the regional bank has run into its own troubles with the Hayne royal commission, Ms Baker said the “environment is definitely ripe for us to succeed”. In her first set of financial results since taking the reins from long-time Bendigo boss Mike Hirst on July 2, Ms Baker said trading conditions remained tough and included declining credit growth, diminishing margins and increased compliance costs. These dynamics came through in Bendigo’s numbers, with second-half income falling sharply as it was forced to cut customer fees to remain competitive and elevated funding costs sliced trading revenue. Nevertheless, cash earnings for the year to June 30 rose 6.4 per cent to $445.1 million as Bendigo was able to reprice its loans higher and bad debts stayed very low. While the royal commission had “cast a shadow across the industry” and trust in the banks is probably “at the lowest level in history”, Ms Baker said she was confident Bendigo’s “community bank” model and relatively strong approval ratings would be recognised by more customers, allowing it to accelerate revenue growth. 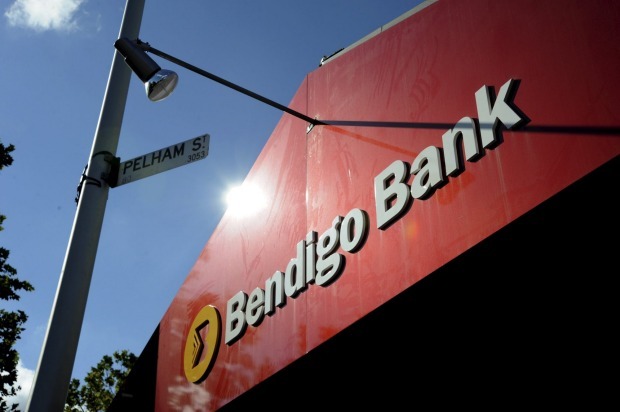 Bendigo and Adelaide Bank’s cash earnings rose 6.4 per cent to $445.1 million for the year to June 30. Bendigo has been working with Melbourne-based fintech Ferocia for six years on its mobile banking platform and Ms Baker said the new collaboration, the digital bank Up, which will be hosted in Google’s public cloud, would be promoted to students to show them how to “spend wisely and save effortlessly”. Up is currently in beta testing with Deakin University; a public launch is planned for October. Meanwhile, Tic:Toc, an Adelaide-based fintech that has developed fast mortgage approval software, of which Bendigo owns 35 per cent, “is a significant opportunity for us”, Ms Baker said. It has received $1.36 billion of mortgage applications and made $170 million of loans since launching a year ago. Despite the new initiatives, analysts are sceptical that the benefits of accelerated digitisation will flow through to shareholders anytime soon. Goldman Sachs analyst Ashley Dalziell said he was “disappointed by the outlook comments” from Ms Baker, after she suggested revenue growth was the focus rather than driving the cost to income ratio, which is currently at 55.6 per cent, much lower. But Ms Baker told The Australia Financial Review after the analyst call: “We are absolutely focusing on both sides” of the income statement. “With Tic:Toc, we should be able to see those savings come through fairly quickly,” she said. She also expects the government’s new pro-competition banking policies, including open banking, will drive customer acquisition. “Up is very well situated to be able to participate in open banking, when that comes, and Tic:Toc is the same,” she said. But open banking and fintech more broadly is always a two-way street and she recognised these will also create a more cutthroat competitive environment for Bendigo. “There is uncertainty about the pace, scale and breadth of disruption of the industry from fintech start-ups and neo-and challenger banks, including unregulated entities who are leveraging these tech advancements to carve out their own opportunities,” she said. That competition showed in Bendigo’s revenue over the past six months, with total income declining by 2.5 per cent to $792 million. Over the second half, non-interest income (including fees) dropped 5.4 per cent on a cash basis – in part because of a “reduction in ATM and transaction fees charged to customers” – while net interest income fell 1.9 per cent, in part due to higher funding costs. But as Bendigo’s new CFO, Travis Crouch, said on Monday, the bank’s net interest margin (NIM) expanded to 2.36 per cent from 2.22 per cent a year earlier, as Bendigo was able to push up rates for borrowers and also reprice deposits in its favour. Goldman’s Mr Dalziell said a flat NIM in the second half “was a strong outcome”, with deposit repricing “helping to offset [loan] competition headwinds”. Shares finished a topsy-turvy session down 4¢ at $11.39, down from a 12-month high of $12.49 hit last August.